After plugging in filter, add 1/2 bag (4.5 ounces) of Filter Aid or 4lbs of Diatomaceous Earth (D.E.). The filter powder should be poured slowly into the skimmer while filter is running. How long should filter run each day? Your EC-40 will filter 2,400 gallons per hour. It is recommended that you turn over the water in your pool at least twice a day (refer to chart at bottom of page for your pools capacity). To keep your pool sparkling clean, run filter more in hot weather, rain or with heavy use. When return pressure (water flow) becomes weak or there is a surge in the pressure gauge reading, it is time to regenerate the filter powder. To do this unplug filter, then move handle at top of filter down slowly then up quickly. Repeat 3 times. Plug in filter and filtration will resume at or near original pressure. When bumping handle no longer extends filter cycle it may be time to backwash the filter. 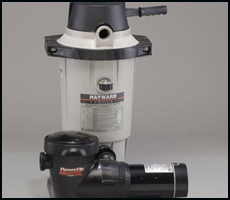 Backwashing completely clears filter of dirt, debris and filter powder by reversing the flow of water through the filter. To backwash, shut off filter and move bump handle at top of filter down slowly then up briskly. Repeat 8 times. Open drain (backwash valve) that is located at bottom of filter tank. Allow water to run until clear, close drain and follow instructions for starting filter.